Can you feel that shift in the air? It’s the movement of millions of people saying no to the daily grind and taking the step to becoming vandwellers. People want to explore the world now more than ever, and van life gives them the tools and the means to travel the globe in style. If you’re thinking about a life of off grid living in small travel trailers or tiny homes then you’ll love this adventure bus from instagrammers @wetravelbybus. This is one school bus that we wouldn’t begrudge climbing aboard in a morning! Skip School And Take A Ride On The Adventure Bus! Picking your base vehicle is extremely important when you’re converting your own van, and there’s plenty out there to choose from. From Mercedes Sprinter Conversions to the classic Ford Transit Camper, campers come in all shapes and sizes. 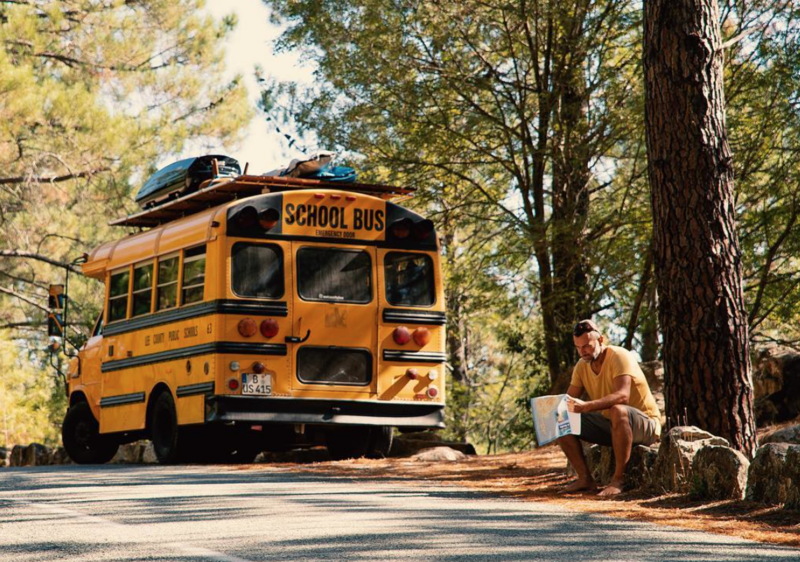 But if you want a classic look that doesn’t compromise on space (and you’re lucky enough to live in the United States) then you can’t go wrong with the classic yellow school bus – a tiny house that’s just waiting for the best adventures. From the outset this school bus has all of the cool features that you’d expect from all of your favourite sitcoms and shows. The original yellow paint job is still intact and shiny and the lights and logos are all in the right places. There’s a couple of added extras that give this (one of our favourite campervan conversions) away though; the roof rack and storage boxes look mighty sturdy and strong enough to carry some serious gear. Would it be ok if we took it for a spin? 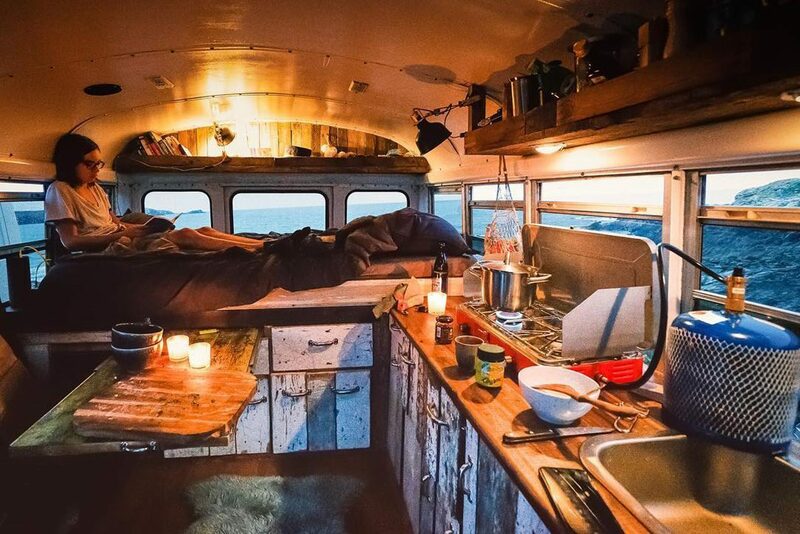 What’s Inside This Adventure Bus? 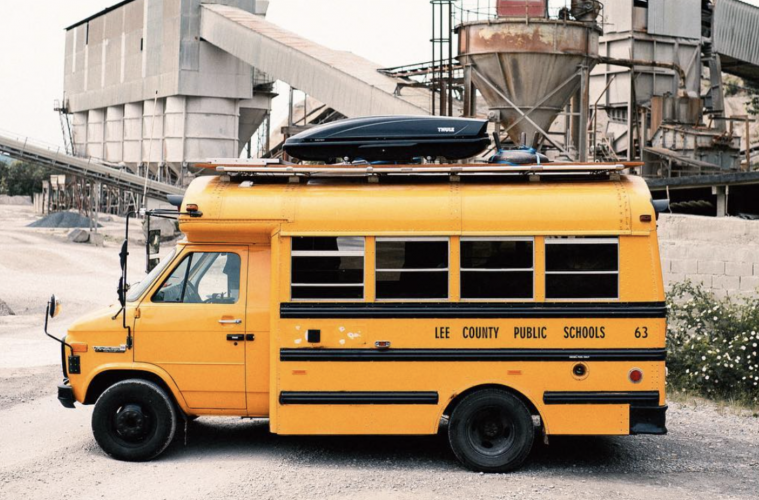 The outside might be everything that you expect from a school bus, but the inside is a completely different ball game (that will teach you to judge a book by it’s cover – ok no more school jokes now). 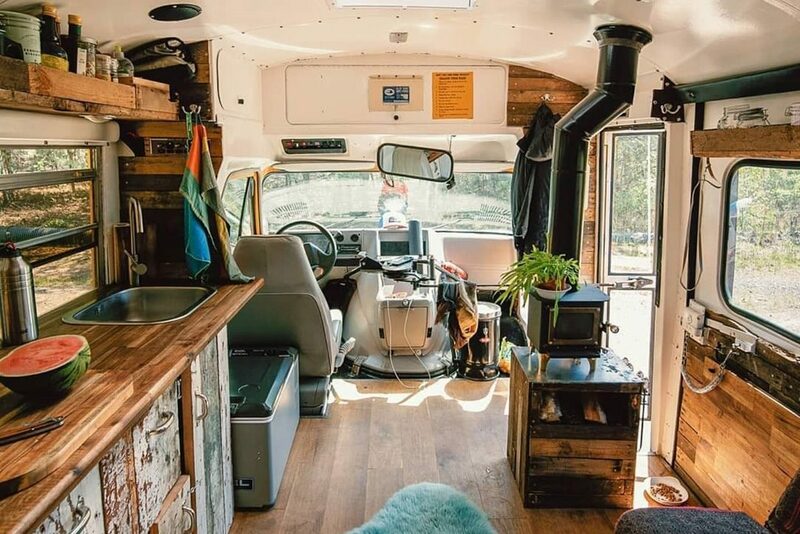 With rich wooden worktops and a tidy multi fuel stove on board, this adventure bus is a luxury tiny home on wheels! The worktops and cupboards are all made from reclaimed timber and add a really cool finish to the living area. The openplay cab/living area also works nicely too, adding to the ample amount of light that comes in through the original bus windows. The curved roof and cosy downlighting make for a relaxing nest to chill out in after a hard days hiking or surfing, and the handy table means that you can eat from bed without having to get out from underneath the covers. @wetravelbybus have got lots of cooking and storage space with their galley cupboard and overhead shelves, and they’ve topped it off with a nice little rug – gotta keep them toes happy, am I right?! 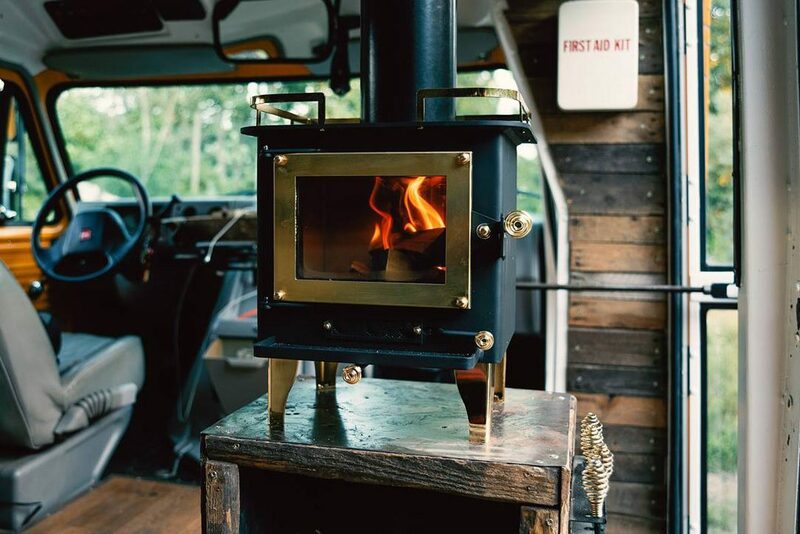 Any adventure bus that has a log burner built in is ok in our book. If you’re thinking about How To Build A Camper then these pictures should give you some great DIY inspiration. 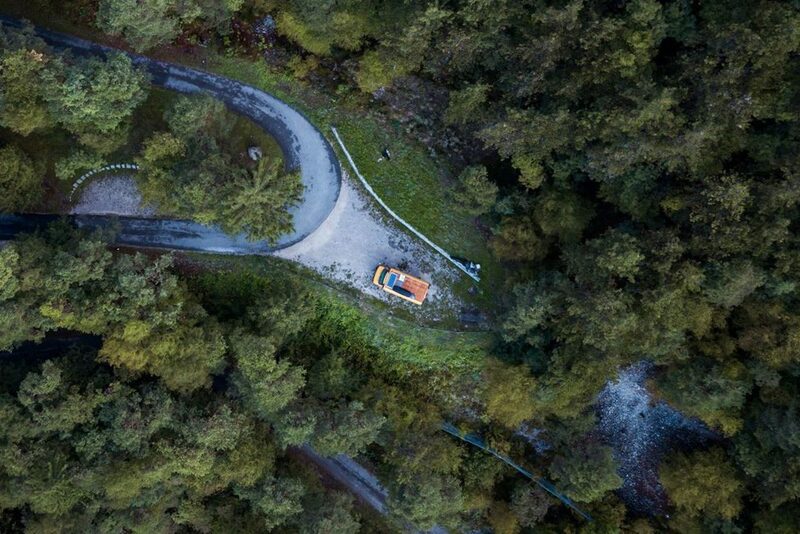 And don’t be fooled by the fact that you usually just see these yellow beasts on flat roads; the school bus can get cope with some pretty tough terrain and they’re built to last. Just think about all of the school trips they’ve been on in their lifetime! 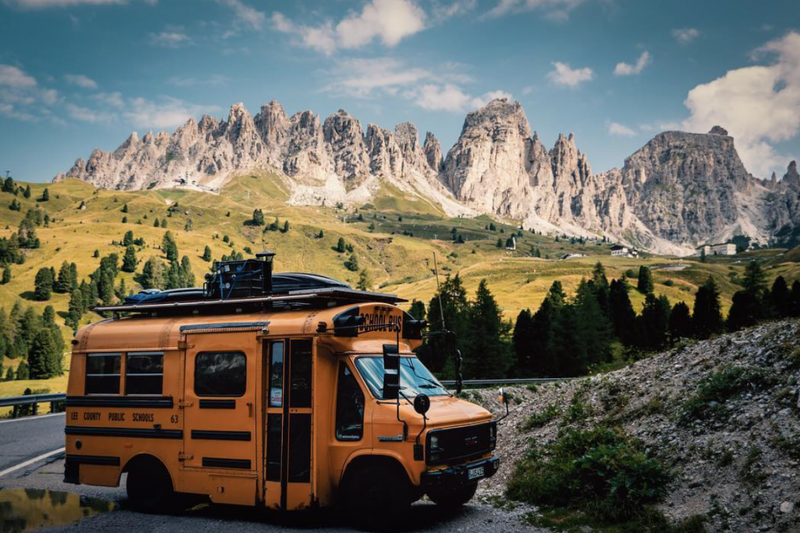 If you’re considering living off the grid full time then an adventure bus could be your perfect creative playground (ok that’s the LAST school joke I promise). Check out these 7 top tips for getting your van build up and running. Don’t want to build one? This extendable camper has tons of ready made room. Looking for a smaller solution? Check out our list of top pop up campers!